In an era of bygone anachronisms and steam-powered ambulatory engines, a sharp-witted street-thief with a heart of semi-precious metal finds herself locked in a battle of wits against a secret plot to bring the city she loves to its knees. Arcadia will need to enlist the help of a reformed mad scientist, a stern suffragette, and a persnickety pigeon to unravel the mysterious past of the Steamwork Consortium - and stop the cabal of sinister mathematicians who would use that past to destroy all of Aberwick. 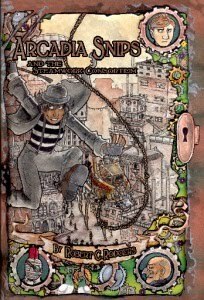 Arcadia Snips and the Steamwork Consortium is both a cautionary tale against reckless mathematics and an accurate historical account all rolled up into one. In fact, the story is so accurate that you might consider it more of a history lecture than an illustrated novel. This book really just confused me a lot, which is why I'm not even bothering to write my own view of the synopsis like I normally would do. The premise of the book was very interesting, but I couldn't get past the first 50 pages, because of the constant switch in narration. It flipped to too many characters continuously, and it was too much for my small brain to digest. One thing I will say about this novel, is that the writing was great, I just couldn't focus on the characters when the scenes would change so abruptly. I may come back to this one in the future, when I have less stress and I can focus more, but as of now, I just couldn't get into it. Sent to me by the author at their request for me to review. Clicking on title links of this book will redirect you to Amazon.com. If you choose to purchase Arcadia Snips and the Steamowork Consortium after clicking on these links I will receive a small percentage of the profits. Thanks for the honest review. Even though it wasn't great for you I would still give it a go. I have a new fascination for Steampunk.